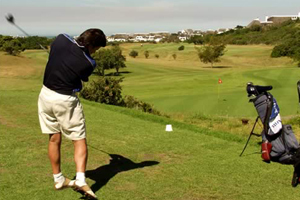 Sandals Guest House near Port Elizabeth South Africa is ideally situated in the picturesque town of St Francis Bay. The ambiance of this attractive wood and thatch “Boutique Guesthouse” is a unique and international blend of superb hospitality, cuisine and service. 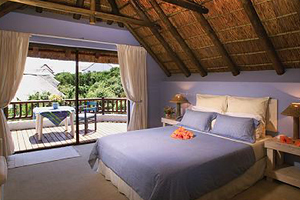 The lush treed and palm-fringed thatched house is decorated in a tropical-African theme and is situated a mere 50 metres from the main beach. Nestling amongst large indigenous rocks echoing to the sounds of birds, Sandals offers conference delegates unsurpassed luxury with its pool bar holiday setting and spacious wooden decks. The secluded conference facilities provide a work friendly environment and a clean sea air atmosphere away from the cities. 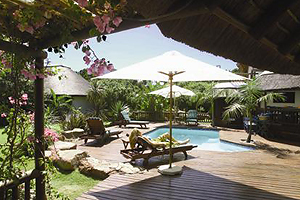 The conference delegate will experience spacious individually decorated bedrooms .Sandals Guesthouse St Francis Bay South Africa has 10 en-suite luxury bedrooms that have sliding doors that open out onto private balconies or the tropical garden. The rooms are equipped with extra length beds and have both baths and showers. Sandals pride themselves on their attention to detail and outstanding service and friendliness to ensure even the most discerning of conference delegates is completely happy. Conference delegates and conference visitors will enjoy the fresh cuisine at Sandals. The vibrant and earthy African – Caribbean decor creates an elegantly charming and cheerful ambiance for conference delegates dining enjoyment. 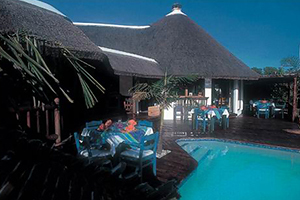 The Sandals cuisine embraces South Africa’s rich natural abundance of fish shellfish fresh fruit and vegetables. Conference delegates can sample imaginative local and international dishes. The food is infused with African spices and Indian Ocean flavours, capturing the essence of South African cuisine. The sparkling swimming pool is set in lush semi-tropical gardens. A comfortable and work friendly environment is provided for delegates at Sandals Conference Centre. Conference delegates can combine work and relaxation creating a highly creative atmosphere without the distraction of holiday makers or the noise pollution and busyness of central cities.